Students who attend The Beekman School in New York City receive a highly personalized curriculum and customized education. They are engaged within a challenging academic environment designed to meet their specific needs. Established in 1925, Beekman has a respected history and tradition of strong academic standards. We pioneered the flexible curriculum within a custom high school and provide a coeducational college preparatory program that is one-of-a-kind in its supportive and individualized approach to learning. Recognizing that no two students are exactly the same, our school blends custom curriculum with personal attention so that students achieve both their personal goals and their academic goals. Our welcoming high school environment is the ideal place for students to embark on new beginnings or to elevate their academics within an encouraging setting. At Beekman, we are dedicated to providing educational programs that focus on an individualized curriculum and inspiring young adults to follow independent paths to success. 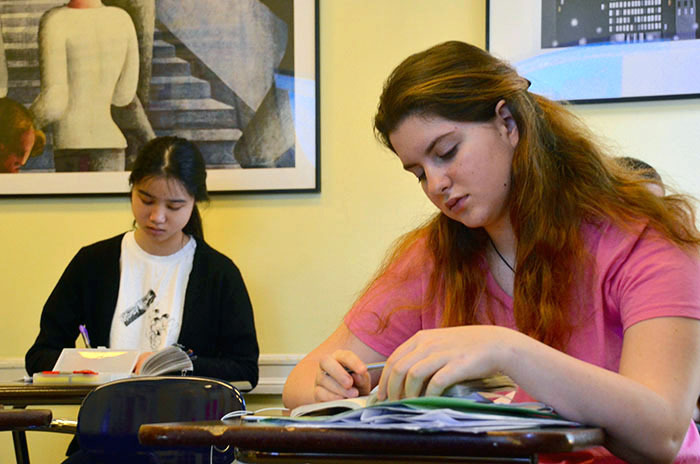 The Beekman School occupies a distinctive and key space on the education landscape of New York City; we offer a traditional college preparatory program that is uniquely tailored and balanced to each student’s needs. From students who are looking for a more challenging environment, to students who are pre-professional and require flexibility in their schedules, to students seeking a fresh start and the promise of success, The Beekman School can create a program that works for virtually any college-bound student. From a seamless transition into the school to a program created to fit a student’s requests, The Beekman School is committed to helping students realize their academic potential and achieve their educational goals. Each student in The Beekman School has an opportunity every semester to discuss course selection with an advisor. Specialized courses may be formed when requested to meet specific interests (e.g. honors or advanced level, remedial and ESL courses) either through The Beekman School or The Tutoring School. If a student requires tutoring, the school works with parents to help set up a tutoring schedule. Tutoring usually occurs after school, as often as necessary and follows daily teacher-supervised study halls, built into the student’s schedule. Learn more. The Beekman School occupies a distinctive and important space on the education landscape in that we are able to offer a traditional college preparatory program that is tailored and balanced to each student’s needs. From students who are looking for a more challenging environment, to students who are pre-professional and require flexibility in their schedules, to students seeking a fresh start and the satisfaction of success, The Beekman School can create a program that works for virtually any student. From a seamless transition into the school, to a program created to fit a student’s individual needs, The Beekman School is committed to helping all students realize their academic potential and achieve their educational goals. Each student in The Beekman School has an opportunity every semester to discuss courses with an advisor. Specialized courses may be formed when requested to meet specific needs (e.g. honors or advanced level, remedial and ESL courses) either through The Beekman School or The Tutoring School. If a student requires tutoring, the school will work with parents to help set up a tutoring schedule. Tutoring usually occurs after school, once or twice a week. Learn more. The average class size at Beekman is 8 students and is capped at 10. Class periods are 45 minutes in length, and there are some double blocks for art and other electives. These classes are taught twice a week, usually from 3:00-4:30 p.m. The requirements of the New York State Education Department form the core of the curriculum at The Beekman School and The Tutoring School. It is strongly advised, however, that students exceed these requirements, especially in the areas of mathematics, the sciences and humanities. In addition to the requirements, The Beekman School faculty has developed many interesting and challenging elective courses. Some of these include: Psychology; the Real Game of Thrones; Forensic Science; various computer courses such as Digital Illustration, Video Production, and 3D Graphics; Creative Writing; Modern Politics; History of New York; Digital Photography; Philosophy; The Mathematics of Infinity; and Drawing. Students can also participate in after-school activities such as student council, the literary magazine, yearbook projects and volunteer programs. In addition to the courses offered on site, students can elect to study music, dance or art through programs around the city and receive Beekman credit for their work. Course descriptions are listed for both one-semester and full-year courses. In making selections, it is important to notice the level of the course offered and whether there is a prerequisite. It is necessary to select alternate choices whenever possible because scheduling or enrollment may determine if an elective course will run. The faculty produces written evaluation reports up to eight times during the academic year, in the form of four mid-quarter progress reports and four quarterly report cards. Progress reports are issued at the halfway point of each quarter if necessary. The progress reports include a checklist ranking the student’s performance in general areas and an early evaluation of how the student is performing. Report cards are distributed at the end of each quarter. The grade on the report card is based on a variety of assessments used throughout the term. These include: homework, class participation, lab reports, projects, tests, quizzes, mid-year and final examinations, portfolios, research papers and major assignments and presentations. All comments on report cards are designed to be informative, thorough and personal. The comments may discuss grades, offer suggestions for improvement or discuss specific learning issues. By incorporating these various measures during classroom teaching, students are also engaged in the learning process. Semester exams take place in January and June. An exam schedule and protocol will be emailed to parents at least two weeks prior to those scheduled dates. Students should expect to have homework assigned every day in all subjects. Weekend assignments are given at the discretion of individual teachers. Students should see their teachers, study hall supervisor or advisor if they need help organizing and completing their work in a reasonable amount of time. Daily homework assignments should take 30-45 minutes per class to complete for freshmen and sophomores and 45 minutes per class for juniors and seniors. Homework assignments are posted daily on the school’s website within each student’s password-protected personal portal. Up-to-date homework information is provided for both current and past assignments, enabling students to keep pace with the work and allowing parents to monitor assignments as needed. Click here to learn how Beekman students handle their homework load. Physical Education is mandatory for all full-time Beekman and Tutoring School students. These credits are not included in the required 20 units. It is recommended that each student in grades 9-12 take six or seven courses each semester. The typical course load is English, history, math, science, foreign language, and one art, elective, or technology course. When high school programs incorporate a strong focus on the individuality of each of their students, those students become more eager to learn and achieve. This is why our hands-on assistance with students designing a personalized and flexible curriculum results in a schedule that matches both their current needs and their future aspirations. At every step of the way, this custom curriculum is developed for each student in our school with the student’s active participation. Curricula merge core classes, which meet or exceed state requirements, with rewarding electives for personalized learning. Our high school students benefit from a custom education that delivers course flexibility as it honors individual learning styles. Why not find out more about our standout New York high school admissions process today?